Mahindra comes in police station. He sees Dhanak in jail and says she is my daughter. Officer says who are you? Mahindra says she is my daughter. Inspector says she was with a guy, she looks educated but you have to prove that they are married. Dhanak says I am not. Mahindra says they are married. Inspector says what is going on? Dhanak says I dont accept this wedding. Inspector says then we will file FIR. Mai comes there. She looks at Raghu in jail. Mahindra requests Mai to tell them truth that they are married. MAi says what are you saying? I dont know you, I dont know what your daughter does outside on road at night, she tells inspector that they are not married. Raghu asks her that dont do this. Mai says you did cheating and now she will bear punishment. Mahindra says they are lying. Inspector says stop all this, he asks to file an FIR. Mahindra cries. Mai says to Raghu that I will wait for you. She asks lawyer to bail. Raghu looks at Dhanak. Dhanak thinks what about my IPS dream? Maya is angry and says Mai is not picking up call. Bai says she will bring Raghu before morning. Maya says he is with Dhanak all night, I cant see them together. Mai comes there. She says to Maya that you will marry Raghu, Dhanak will remain in jail. Mai says now Raghu will listen to me and marry you. Mahindra comes there and says you lied to me? Mai says you can learn from me. She says why are you shouting? Mahindra says you lied to me, cheated me. Maya asks him to keep voice down. Mahindra says why didnt you save Dhanak? her dream will destroy. Mai says I wanted to help you but.. flashback shows how Mai asked lawyer how she can separate Raghu from Dhanak? Lawyer says if FIR is filed on her then she cant become an IPS officer, flashback ends. Mai says to Mahindra that I bailed my son, you can save your daughter, she is gone now from this chawl. Mai sees auto coming in chawl and thinks Raghu is coming. Dhanak comes down. Mai is stunned. Mahindra hugs her and cries. Mai says how this happened? Dhanak glares at her and says what happened? you are shocked? you think you can throw me out of this chawl? law will work here from now on and I will stay here. She leaves with Mahindra. Maya says how this happened? Raghu prays in mandir and thanks Ganpati for saving Dhanak too. Aslam gets call and says yes Raghu is with me. Mahindra says thank God you are here. Dhanak says God is with good people, dont worry now. Dhanak thinks that what did Raghu say to police that they left me? Flashback shows how Raghu asked Dhanak to accept their wedding so they can get out of jail, she says never. Raghu sees inspector filing an FIR and says give me a chance, I will prove that we are married. Officer brings him out. Raghu takes his mobile and shows his pheras with Dhanak. Inspector says you married her for real? Raghu says she is my wife, we are fighting, you face that too? he says it happens all the time, whats your problem? Raghu says she keeps shouting. Inspector asks to free Dhanak. Dhanak comes out and thanks inspector. Inspector says it happened because of Raghu, flashback ends. ASlam says now she will become an IPS. Raghu says she is my wife, her dreams are mine, I will keep trying to win her over. Dhanak thinks that he freed me from jail so I can forgive him? never. 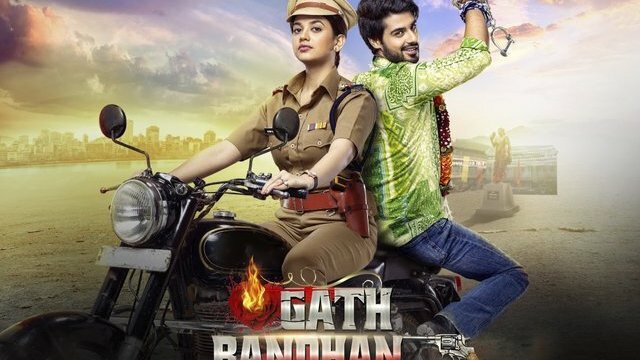 The post Gathbandhan 20th February 2019 Written Episode Update: Raghu frees Dhanak from jail appeared first on Telly Updates.